Towering Monuments & Tombstones: The Historic Jersey City & Harsimus Cemetery ~ The History Girl! Tucked away in Jersey City between apartment buildings and the elevated New Jersey Turnpike Extension is a six acre oasis of green space, trees, tombstones, and wildlife with a view of the Manhattan skyline. This very sacred ground has been witness to more than 300 years of history beginning with the first Dutch settlers of the early 1600s. Over time, the grounds were host to skirmishes during the Revolutionary War, served as a lookout during the War of 1812, and finally a training ground for soldiers in World Wars I and II. In between these military events, New Jersey’s first cemetery company was established in 1829, a revolutionary idea in cemetery reform. 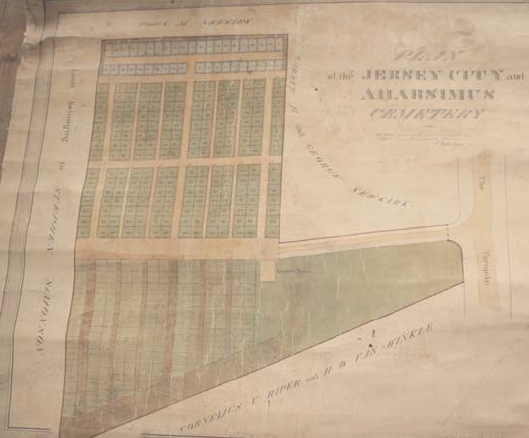 The Jersey City & Harsimus Cemetery is located on the outskirts of the historic Harsimus Cove neighborhood. In 1629, the Dutchman Michael Reyniersz Pauw obtained a patent for all the land in what would become Hudson County, naming it Pavonia. Unable to fulfill the provisions of the patent with the Dutch West India Company, a part of his patent was sold to the Van Vorsts family. The Van Vorsts would later play important roles in the development of Jersey City. Conflict with Native Americans compromised the settlement numerous times between 1643 and 1655. Finally in 1660, the land came under the jurisdiction of Bergen, New Netherland, the main village of which was located at Bergen Square, at the intersection of present-day Bergen Avenue and Academy Street in Jersey City. Harsimus is a derivative of a Lenape phrase, possibly meaning Crow's Marsh. In 1664, a negotiated surrender gave control of New Netherland to the English. In 1674, soon after the British possession of New Netherland was formalized, the village at Bergen became part of the proprietary colony of East Jersey, and the "capital" of one of four newly established administrative districts. The area around Harsimus developed into a port, receiving shipments from across the Atlantic. The area remained relatively quiet until the American Revolution broke out. The area saw multiple Revolutionary War skirmishes, including the Battle of Paulus Hook which took place August 19, 1779. In October of 1780, General Marquis de Lafayette joined with the American forces, at the request of General George Washington, to challenge the English on the grounds of the future cemetery. The high ridge that exists today was a vital lookout post. Records indicate that General Lafayette led 4,000 French troops to assist the American Continental Army against the British troops in Jersey City. These men would encamp on the grounds of what was to become the Jersey City & Harsimus Cemetery. It was not until 1812 that the future cemetery grounds would be used once again for military activity. When the War of 1812 broke out between the United States and England, an active ammunition bunker and lookout point was established. The idea of a non-denominational cemetery in Jersey City surfaced in 1829, after an unidentified man was found on the shore of the Hudson River off Paulus Hook. Local residents wanted to bury the man in the cemetery at Old Bergen Church. However, local lore suggests that the fees for digging a grave were too steep. To circumvent the church’s high fees, a meeting was held at Hugh McCutcheon's Farmers' Hotel at 42 York Street. The meeting resulted in a decision to form a cemetery company and eliminate the need to use the church burial ground at Bergen. Local landowners sold portions of their properties off of what is today Newark Avenue. The new cemetery was officially incorporated on February 9, 1831. David Cadwallader Colden, son of Cadwallader Colden, the mayor of New York City, became the president of the board of trustees. This was the first cemetery company established in New Jersey by a non-denominational group. The original cemetery grounds were surveyed to include 347 lots. It included 18 foot by 18 foot family plots and 12 foot by 18 foot vault lots. Paths were built throughout the grounds for visitors and carts. According to the cemetery’s meeting minutes, original cemetery subscribers paid $20.00 per lot. The owners would then have a vote in electing the board of trustees, which at that time was unheard of, since churches virtually maintained control of all other cemeteries. A caretaker’s home was completed by 1848. The original ammunition bunkers were renovated in the 1830s into three family vaults for the Colgate family. William Colgate, founder of the Colgate's Soap and Perfumery Works, later Colgate-Palmolive, was one of the first subscribers, but the family members were later reinterred at the Green-Wood Cemetery in Brooklyn. The vaults were then converted into receiving vaults and used to store the deceased during the winter months when the ground was too frozen to be excavated. By the mid-1800s, the Jersey City and Harsimus Cemetery began to embrace a new movement in cemetery design. The Rural Cemetery Movement included landscaping of trees, plants and flowers, the addition of an iron gate, and the construction of a Victorian greenhouse. The cemetery transformed into more than just a burial ground. Families would spend the day at the cemetery, visiting the graves of loved ones and enjoying the well-manicured grounds and monuments. The cemetery may have been active during the Civil War. Hundreds of Civil War soldiers are buried in the cemetery, but legend suggests that the grounds may have played an important role in those seeking freedom. It is believed that cemetery’s crypts may have functioned as a part of the Underground Railroad. Oral tradition says that tunnels existed between the cemetery grounds and Dickinson High School across the street; however this has been yet to be explored or substantiated. The last of the cemetery’s military involvement came during World War I and II. The cemetery grounds and crypts were used for training soldiers. Many artifacts dating to that period have been found and preserved. The cemetery fell on hard times within the past few years. In 2008, the cemetery was abandoned. Members of the board of trustees for the cemetery had slowly passed away over the years and were not replaced. There was very little oversight at the cemetery and the caretaker allowed it to become overgrown and vandalized. Almost overnight the cemetery was abandoned and bankrupt, with no one to care for the grounds. After eight months of neglect, a new volunteer board of trustees was formed to oversee the cemetery and work toward its revival. For over four years, volunteers have met each Saturday to cut trees and brush, remove litter, and reset stones. The caretaker’s house was cleaned up after it had become a haven for the homeless and wild animals. However, their job is far from complete. There are still dozens of stones that are buried, sinking, and fallen over. Pathways throughout the cemetery require care to avoid small sinkholes. The battle of the weeds are a never-ending problem. The cemetery’s new caretakers have held numerous fundraisers, events, and tours to raise awareness for this historic and important Jersey City landmark. It is their hope to eventually restore it to its former glory as a park, where visitors may stroll the grounds while admiring the tombs and monuments of our forefathers. Today the cemetery is filled with markers bearing the names of descendants of early Dutch and English settlers like Jacob Van Riper and May Rood Drayton. Stones memorialize the names of Germans, Russians, Polish, and Italian immigrants who arrived in America at the turn of the century in hopes of living the “American Dream.” Jersey City has all but enveloped this secluded and quiet six acre plot in a city of concrete and steel. The Jersey City & Harsimus Cemetery remains a safe haven for the departed as their monuments and tombstones silently watch over the rolling hills and gentle slope of this hallowed ground that for the past 350 years has witnessed bloodshed, sadness, and now a new lease on life.